The fully automatic case erector CE-11-P guarantees perfectly squared cases, which is required to obtain a controlled and trouble-free packaging process. 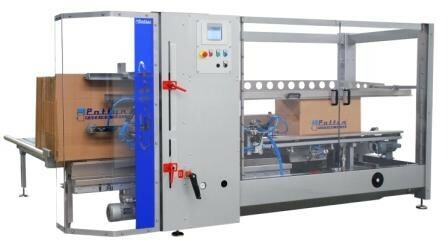 The box erecting machine automatically forms cardboard boxes with length up to 730mm. Using hot melt as standard, but also available with a tape sealer. By using hot melt to close the bottom flaps, the carton erector enables continuous production, low running costs and stable case transport. With easy format changeover and features to accommodate poor corrugated cartons, this case erector is a solid addition to your packaging line.